When Promises Fulfilled upset the Fountain of Youth (G2) at odds of 18-1, it wasn’t the first time he was cast in the role of underdog – or rewarded those who believed in him. A sick newborn and a bargain yearling, he’s come a long way to emerge as a Kentucky Derby (G1) contender. Promises Fulfilled’s tale revolves around families, both human and equine. He was bred by David Jacobs, a small-time Kentucky breeder who began dabbling in bloodstock after buying one mare, the hard-knocking claimer Copelan’s Girl. He and his late wife, Andrea, cultivated a family from that single mare’s descendants. “Dave always kept the fillies to race as he promised Andrea. She loved her girls,” recalled Julie Rini of Crowning Point Farm, where their horses were foaled before being raised on the Jacobs’ farm near Stamping Ground, Kentucky. Sadly, Andrea passed away in 2012, and David thereafter boarded his mares at Crowning Point, where Promises Fulfilled was born and raised. The Paris, Kentucky, farm is located near such industry titans as Claiborne, Stonestreet, and Adena Springs. Owned and operated by Rini and her husband, Robert Nowak, Crowning Point is a case in point that less well-known nurseries are just as capable of raising a top horse. Moreover, Rini played a pivotal role in the breeding of Promises Fulfilled. She’s a fan of the multiple Grade 1-winning stallion Shackleford, the fourth-placer in the 2011 Kentucky Derby who turned the tables on Animal Kingdom in the Preakness (G1). That exceptional fertility was the clincher in the decision to send Promises Fulfilled’s dam, Marquee Delivery, to visit him. A granddaughter of Copelan’s Girl, Marquee Delivery was a Grade 3-placed earner of $264,901 on the racetrack. She’s since proven a good broodmare too, producing the multiple stakes winner and Grade 3-placed Marquee Miss and multiple stakes-placed Marquee Cal Gal. Shackleford duly got her in foal on that single cover, and 11 months later, Marquee Delivery delivered her baby. But there was an immediate problem afterward. “When he was born he was a bit slow getting started, a bit of what we call a ‘dummy foal,’” Rini said, adding that customary term isn’t harsh or derogatory but simply shorthand for the complex of symptoms afflicting the newborn. “His birth seemed normal but maybe there had been something going on inside the mare that we were not seeing. Often associated with oxygen deprivation to the brain either before or during birth, another technical name, “hypoxic ischemic encephalopathy,” refers to that cause. But Dr. Metcalfe explained that the syndrome can have other causes as well, and the latest knowledge suggests that any kind of inflammation within the mare can precipitate this complication. The syndrome affects the brain and nervous system, and classic symptoms include an inability to find the mare’s udder, lack of attachment to or interest in bonding with the dam, depression, and other abnormal behaviors. It can also involve the gastrointestinal tract or renal system. Dr. Metcalfe noted the protocol is to provide supportive care to help the foal through the recovery process. That involves a multifaceted approach ranging from plasma, antibiotics, anti-inflammatories and gastric medication, to vitamins and antioxidants. “She came out in the middle of the night,” Rini recalled, “and treated him with special IV fluids containing DMSO (dimethyl sulfoxide) and certain vitamins that help with this condition. Through it all, Rini tended to the foal, and he responded to the loving care. Such a happy conclusion occurs in most cases, according to Dr. Metcalfe, and the long-term prognosis is excellent once the foal gets past those first few critical days. As the colt grew, the time came to prep him for the Keeneland September Yearling Sale. That someone would turn out to be trainer Dale Romans, thanks to the quick thinking of Carrie Brogden of Select Sales, which consigned the colt as agent. Brogden is a breeder herself, as the co-owner of Machmer Hall with husband, Craig, and her mother, Sandy Fubini. Machmer Hall has risen to prominence on the breeding scene in just several years, with two-time champion turf mare (and surefire Hall of Famer) Tepin their marquee name. So Brogden knows well all that goes into raising young Thoroughbreds who can perform on the track, including the “baby issues” that commonly occur in the course of growing up. One of those is osteochondritis dissecans (OCD), a developmental condition that can lead to bone and cartilage coming loose in a joint. The colt had OCD in a stifle, and Brogden said that he underwent minor surgery to clear it up. But buyers at sales can be very picky, put off by anything less than perfection. “He didn’t have perfect vetting,” Brogden said, adding that perfect vetting is no guarantee of racing ability, and that top runners can have imperfections as youngsters. Combine that vet report with being a May 11 foal who was good-sized but not as filled out or robust as the yearlings who were born months earlier, and by a sire who was just getting started, and it was a recipe for a bargain-basement price. For that reason Brogden hoped that he would be cataloged in Book 3, later in the sale, where he had a better chance of standing out. Instead Keeneland listed him in Book 2, up against a deeper pool of offerings. 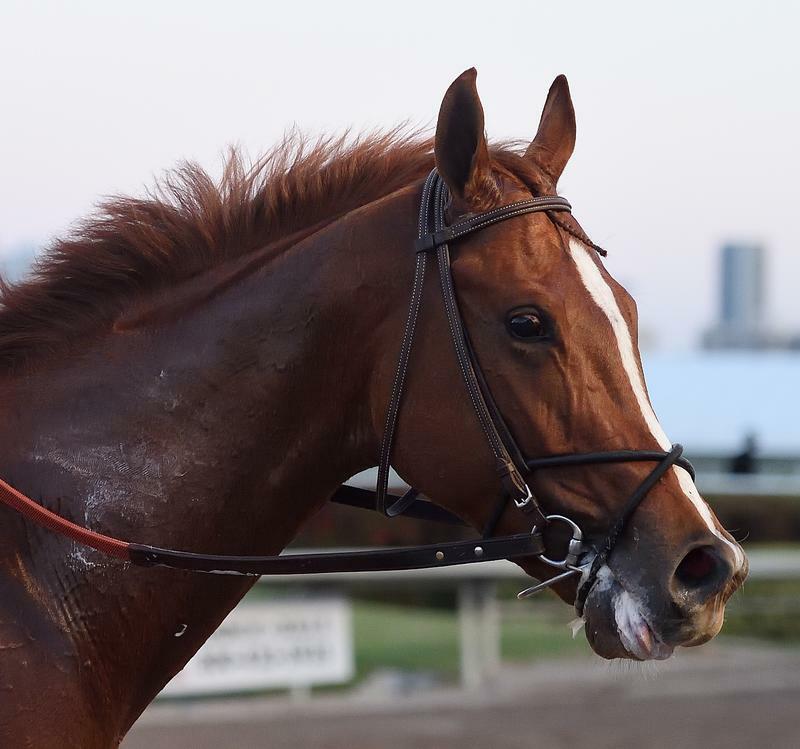 Shackleford’s son was inspected and vetted by a few prospective buyers at the barn, but they weren’t there when he drew near the sales pavilion. Then Brogden spotted Romans, who had trained Shackleford, and saw her chance to make the sales pitch. Now it was up to the colt to impress the trainer. He “showed himself with such presence,” exuding “some kind of class,” that he did just that. His expert horseman’s eye knew what was significant and what wasn’t, and he was able to buy him with a winning bid of just $37,000. Brogden describes it as a classic case of going with your instincts. At a sales scene replete with all kinds of measuring tools, Brogden emphasizes that it’s the intangible qualities that count the most. It’s all about heart, not the physical organ, but the moral courage that accompanies talent and the will to perform. After Romans purchased him, the colt was acquired by a longtime client, Robert Baron. His new owner gave him his name, and fittingly given the youngster’s history, there’s a heartwarming story behind it. The idea came as Robert and his wife, Deborah, were celebrating their 44th wedding anniversary. Their fidelity to vows was very much a lifetime of promises fulfilled, encompassing their children as well. And on a lighter note, Romans was fulfilling his promise of finding a good horse for Baron. Now Promises Fulfilled can keep living up to his name by reaching his potential on the racetrack. What a tale it would be if the newborn who couldn’t find how to nurse from his mom can find his way to the Derby winner’s circle.